Murder mysteries, horror plays, and more by Micah Delhauer. Are you looking for your next theater project? You’re in luck! I have a number of produced plays, both full length and one-act, available to license. These are interactive mysteries that fully immerse the audience in the world of the story. The characters engage guests as they arrive, making them part of the evening’s events. During the act breaks, the characters serve food and dessert, all the while keeping the mystery going by improvising with the guests and each other, challenging the patrons to try and solve the mystery. “Speakeasy, Die Easy” is an homage to the hardboiled detective fiction of the 20s and 30s. Contains some expletives and innuendos. Christmas Eve, 1953. The staff and guests of the Rosedale Hotel are snowed in. No one knows where to find the hotel’s manager, Milton Rine…until the staff members open their Christmas gifts, that is. Looks like Mr. Rine has gone all to pieces. Was it one of the guests? An angry employee? Or was it one of the ghosts said to haunt the rooms of the Rosedale? It’s up to P.I. Michael Archer to solve the case before the killer can strike again. But the enigmatic detective has a secret or two of his own. 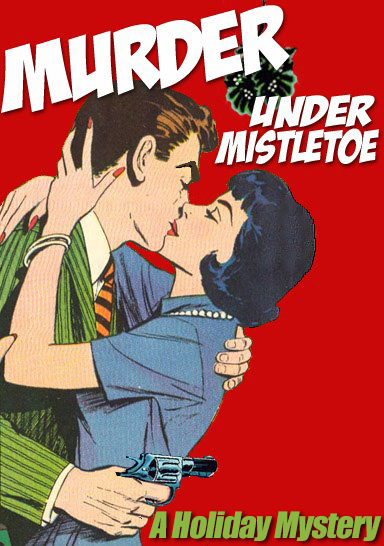 “Murder Under Mistletoe" is an interactive dinner theater mystery with an outrageous cast of characters and a touch of black humor. Contains mild expletives. "ELAINE WHALES AND THE MUMMY OF KING KHUFU"
London, 1925. American reporter Elaine Whales is covering the unveiling of the newly-discovered mummy of King Knum-Khufu. She finds herself with the story of a lifetime when the sarcophagus is opened and, instead of the mummy, the exhibit’s manager is found dead inside. Has the mummy risen to take revenge on those who have desecrated his tomb? Or is this a case of old fashion murder? “Elaine Whales and the Mummy of King Khufu” is a wildly comical interactive mystery with a whopping five alternate endings to keep audiences coming back. Contains mild expletives. "ATTACK OF THE CREEPING MENACE (IN 3-D)"
Ray’s Burger Hut is the hippest joint around. But when a swarm of giant, radioactive mosquitos invade the town, the rockin’ diner becomes the only refuge for a group of citizens seeking shelter from the terrors outside. Things go from bad to worse when the diner’s owner suddenly drops dead of no apparent cause. It looks like there’s a murderer in the diner. Inside or outside, no one is safe! “Attack of the Creeping Menace (In 3-D)” is the long-awaited merging of the parlor room murder mystery and the 1950s giant bug movie. It boasts a cast of colorful characters and a series of “scares” that make it a perfect Halloween production. Requires sound effects and some physical effects. Contains mild expletives. These shorter pieces are perfect for a night of ghoulish entertainment, adapted from the short stories of renowned horror author H.P. Lovecraft. Set in 1930s New England and based on the short story by horror legend H.P. Lovecraft, “The Thing on the Doorstep” is a dark trip into the world of the supernatural. Contains adult language; recommended for mature audiences. Joey, Silvia, and Angelo are three low-rent hoodlums looking to score their big break. While passing through the quite little town of Kingsport, they learn of a mysterious old man who lives alone with a vast wealth in gold. While the locals keep their distance from the ancient hermit, the three crooks see him as an easy target, and make plans to relieve him of his surplus wealth. It’s only too late that they realize there’s a reason the people of Kingsport shun the terrible old man. Set in 1930s New England and adapted from the short story weird fiction author H.P. Lovecraft, “The Terrible Old Man” is a grizzly dark comedy perfect for an evening of ghoulish one-acts. Contains adult language.